Hometown Values is a free publication distributed to more than half a million homes amongst 15 different markets ranging from Cache County to Southern Utah County. Each market zone has its own custom Hometown Values magazine that highlights and holds focus on the local businesses within the subscriber’s designated market area (Smart publication distributed downtown Salt Lake City and Summit County). This featured, hyper-localized outreach opportunity is a significant way to personalize your brand and relationship to consumers closest to your location(s). Hometown Values has a proven record of helping businesses grow and succeed through targeted, market-driven advertising. Our monthly, direct mail community magazines help consumers save money and help local businesses grow their bottom line. 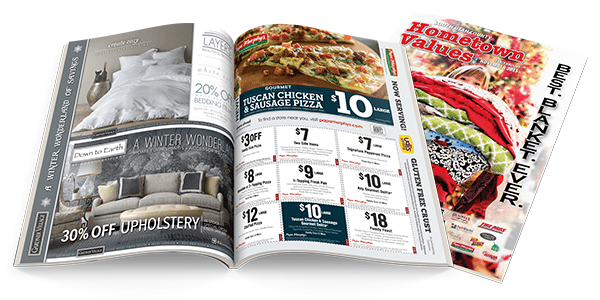 Our monthly, direct mail magazines offer deals on products and services, from dining out to home improvement. Hometown Values consistently delivers results for our advertisers by focusing on what works and having the expertise to implement it effectively. *For market zone circulation information, contact your Hometown Values representative.